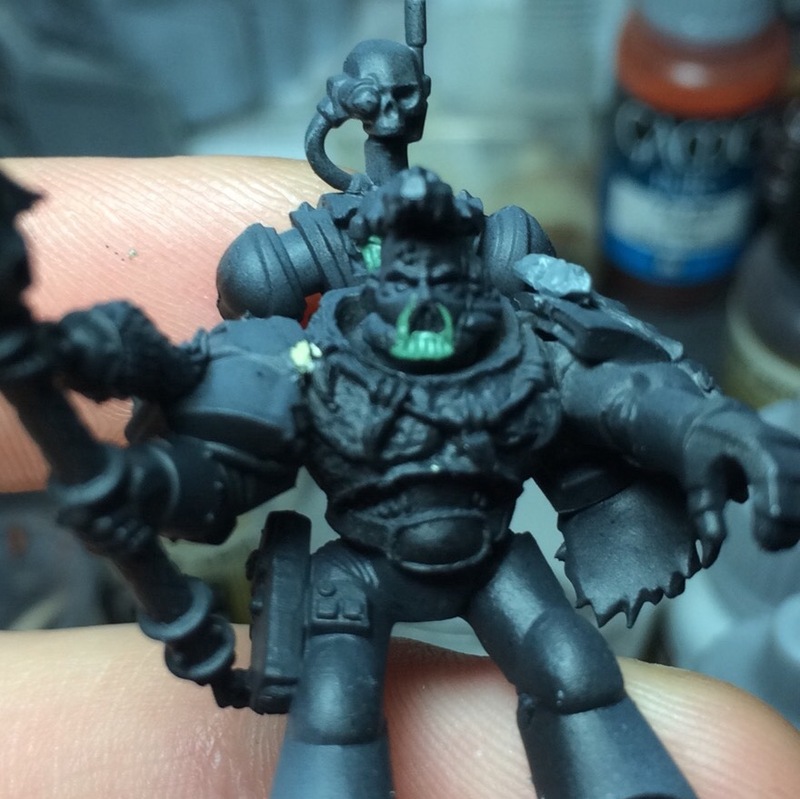 I’m working on my Space Wolves army for 2015. A bit of a New Year’s resolution to stay focused on one army until I complete 2500 points. I’m playing in a 6 event escalation tournament this year that starts at 1250 and works its way up by 250 point increments. It does not allow Forge World, so I’ll end up going over 2500 points as I’m also taking Space Wolves to the Las Vegas Open in February. 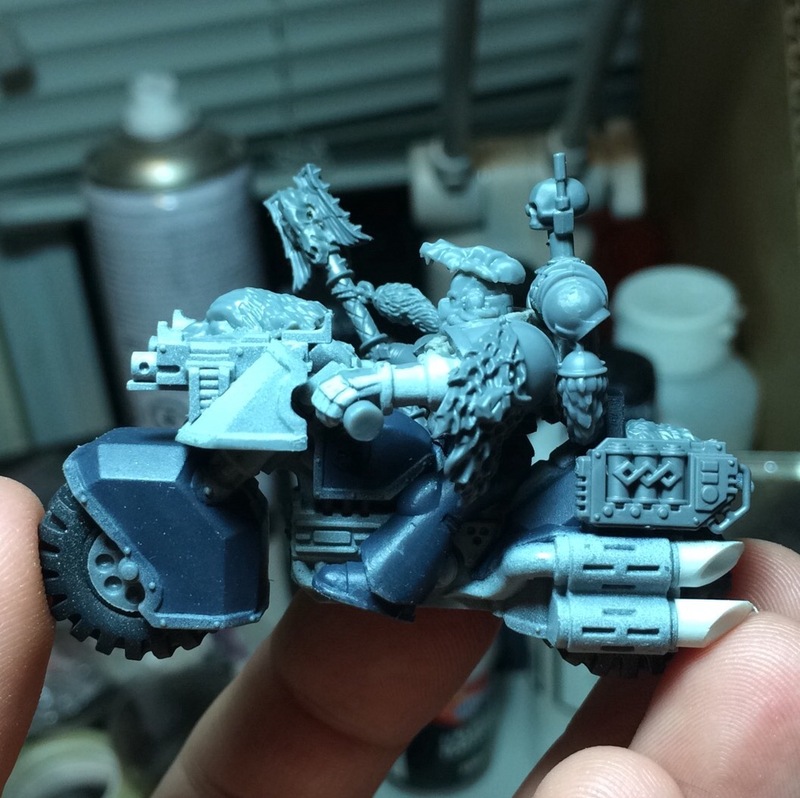 In a recent game, I decided that I wanted to try out a Wolf Priest on bike with a large Thunderwolf Cavalry “death star.” There are some tradeoffs to be had, but this article is about the modeling and painting and not the tactics. So, without further ado, this is what I did over the weekend. You might recognize this crozius Arcanum, but I’d forgive you if you don’t. 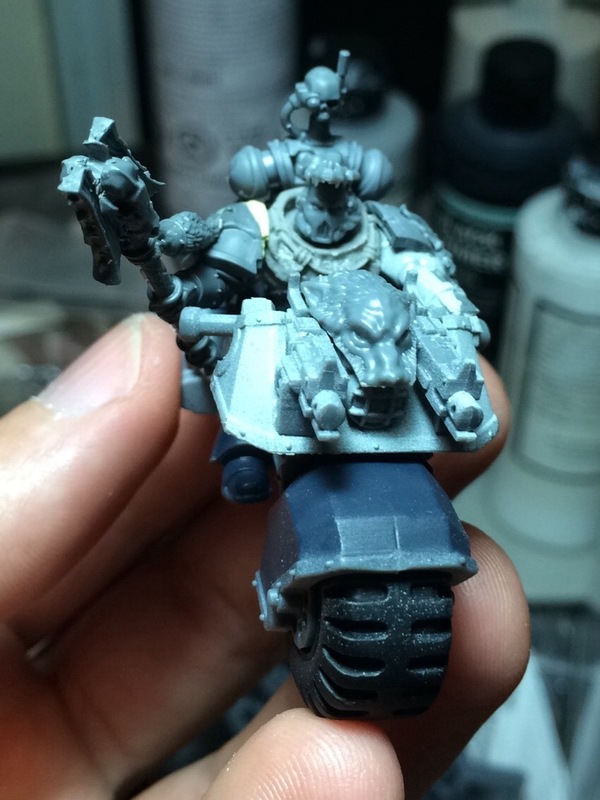 It’s from the limited edition chaplain from the original Dark Vengeance set. I ended up acquiring a second one from a team mate. A shaved off the angels, added some skulls, removed the skull rosaries and added a wolf tail and finally removed the spike on the bottom and later added a wolf tooth. Here is the model, almost fully assembled. I still had a bit of work to shave off the apothecary symbol and blend the wolf skull into the helmet. 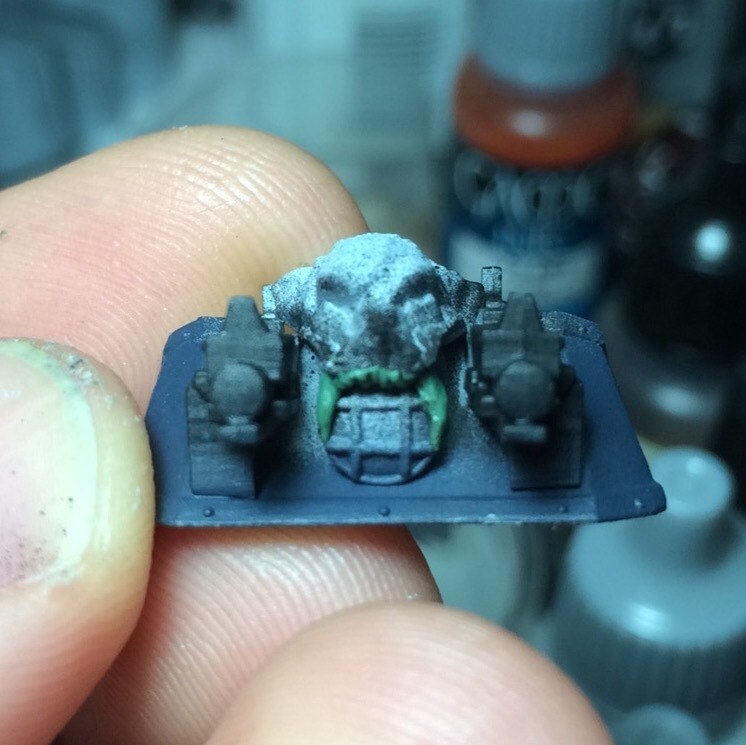 The wolf skull comes from the new Space Wolf dreadnought kit, as does the wolf head pelt. 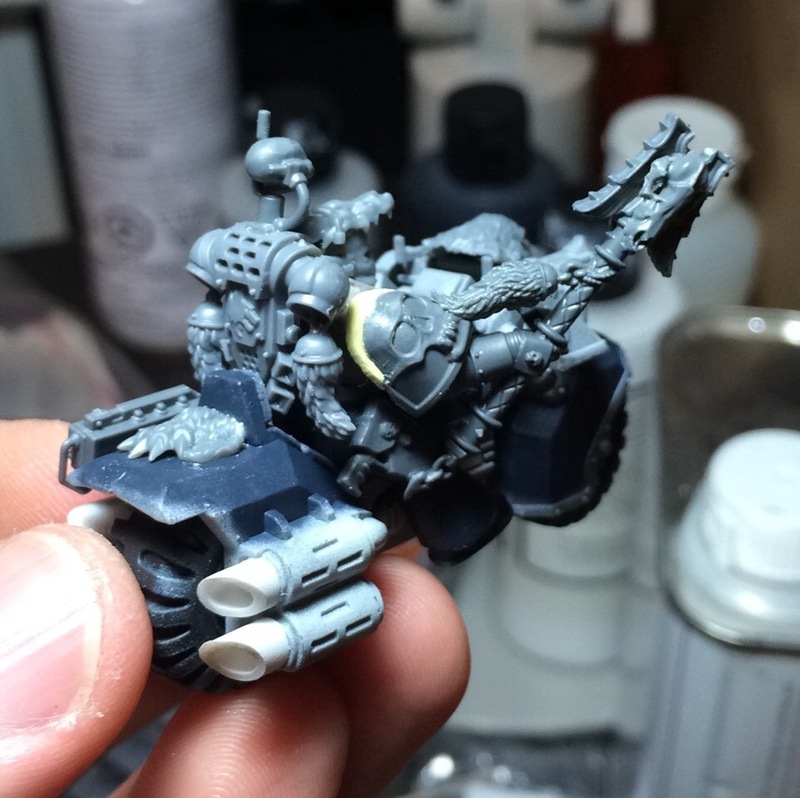 The juice box comes from the Ravenwing Command squad, and the horn (not pictured) comes from the Space Wolf terminator kit. 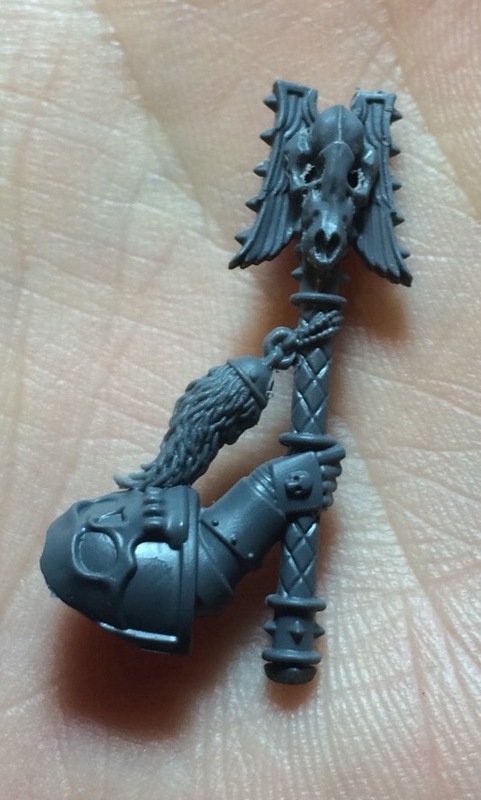 Finally, the wolf pelt on the shoulderpad comes from the TWC box. 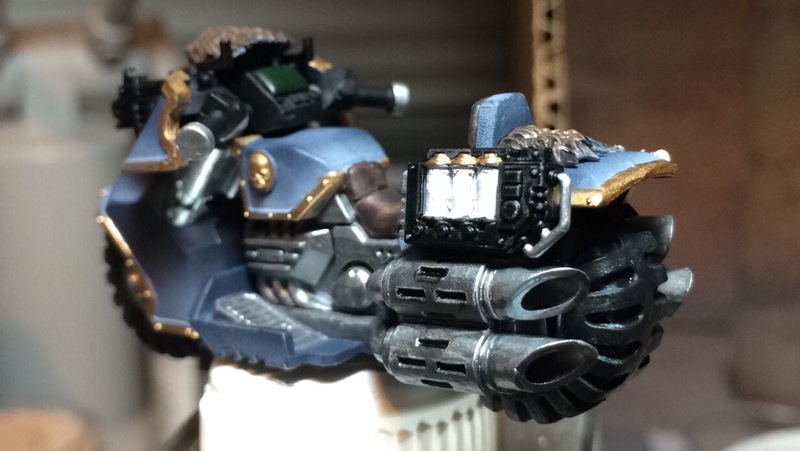 Still need to drill out the bolters and blend the wolf head to the fairing. The torso comes from Spellcrow miniatures. I added a wolf horn to the rear fender, and added the skid plate to the bottom of the bike. I made the slash cut pipes out of plastec and the paw is cut off the head I used on the front fairing. Here we have the lower fangs added to the breather, just like the Gamesday limited edition Wolf Priest from 2003. The paint shading has been done and I’ve blocked in most of the colors, to get a feel of what the bike will look like. Here are some fangs on the wolf head. I’m not the best with green stuff, but I think it will be passable once painted. The 6+ FNP juice, AKA Healing Balms, needs some color. Well, that’s it for the weekend. I’ve got a ton to do before the 1250 event on Saturday. 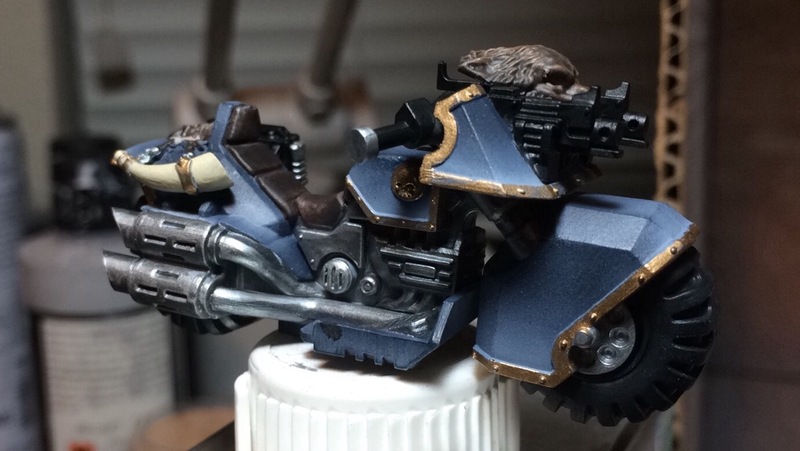 This entry was posted in Modeling, Painting and tagged Bikes, Space Wolves, Wolf Priest by Peter Kelly. Bookmark the permalink. Excellent progress so far. I love the blocked in shading on the bike. Adds a ton of interesting and looks really cool. Lots of details on this fellow, keep up the great work! Thanks Greg. After a few years of toying with the airbrush I figured I should actually get serious with it. The challenge for me on a model like this is all the conversions. If it were just a plastic kit I’d paint the pieces in chunks with the airbrush and then assemble after the fact, but I can’t do that with a kit-bash. I’ll post more later this week once I get it assembled at table-top level. Having just started using the airbrush myself, you are doing a fantastic job with it. I have a lot of trouble getting really narrow sprays. I’m mainly doing ork stuff, so its good practice for now. 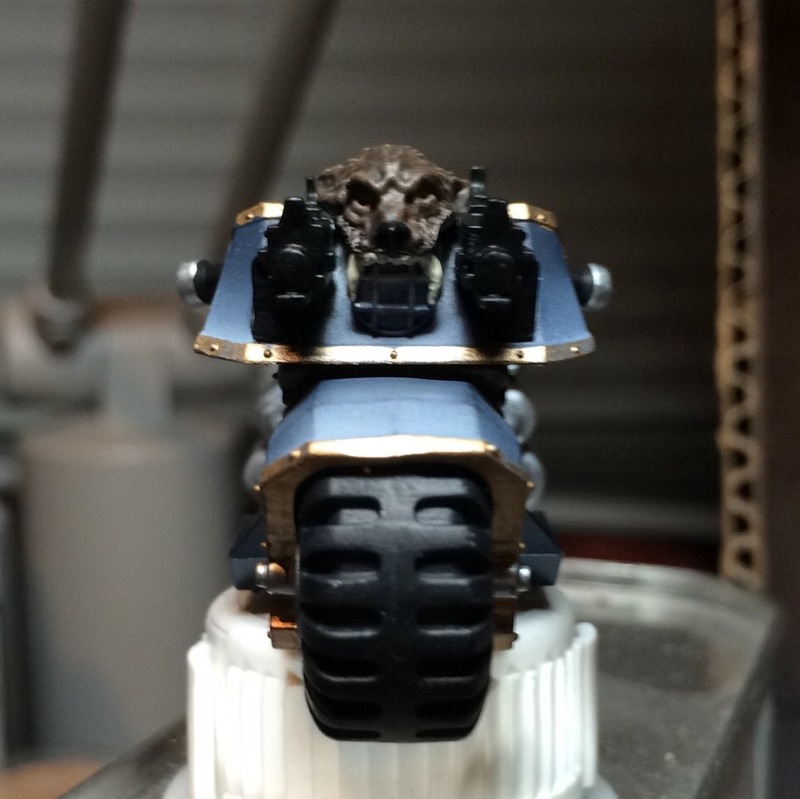 Are you using airbrush ready paints? I still haven’t figured out the exact mixtures to mix things with…i fishhooked one needle, and i swear my replacement is clogging even more!